Don Macrae sent through the suggestion and provided this review of wheel sets. Don added this note “Not exactly an old fart’s wheelset, but stuff ’em“, no going gracefully hey Don! Choosing a Wheelset: Lightweight or Aero? A climber’s wheel is light but comes with a drag penalty. An aero wheel offers low drag but comes with a weight penalty. Which factor is more important, aero or weight? The answer is definitely aero. For a given power input an aero wheel is significantly faster on the flat, and a climb has to be very steep for a lightweight, non-aero wheel to be the right choice, and even then the benefit is very small. You’ll gain time on almost any ride with an aero wheel. 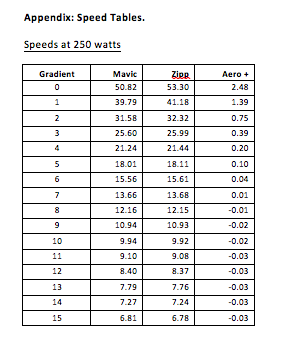 This analysis compares a Mavic R-Sys, the climber’s wheelset, with a Zipp 808, the aero wheelset. A rider generating 200 watts will be 2.21 kph faster on the flat with the Zipp – a significant difference. At a gradient of 7% speeds will be the same for both wheels, and on a 15% grade the Mavic will have the advantage, but it is only 0.03 kph: insignificant. This analysis implicitly assumes no wind or else a block headwind. Side winds may affect the efficiency comparison but if so, in which direction I do not know at this point. Some of the factors which should influence your choice of wheel are hard to quantify, for instance how well it absorbs road shock and how well it behaves in fast corners – although these factors are significantly influenced by tyre choice and pressure. Some testers mention how well a wheel ‘accelerates’, but while increasing the rotational velocity of a wheel absorbs energy, the energy is not lost, it is returned when the wheel spins down. Stiffness is quantifiable and quite a lot of it seems desirable – you don’t want your rear to rub on the brakes – but may well be related to comfort. Behaviour in side winds may be important too. But in addition there are the quantifiable factors of drag and weight. A lightweight, highly aero wheel would be ideal, but aero typically comes with a weight penalty. A climber’s wheel would be light, and a time triallist’s wheel would be aero. So we should aim to strike the right balance for the riding we do. This analysis will compare two wheels, a climber’s wheel and an aero wheel. Each wheelset will be represented by two statistics: its weight and its drag. Weight is straightforward: it’s the weight of the wheelset without cassette and without tyres and tubes. Drag is represented by the number of watts required to drive the front wheel only at 50 kph. This statistic was chosen because it is available in the ‘Great Wheel Test 2008’ on Roues Artisanales.com. They say the drag on the rear is affected by the frame and the rider, so left it out. Drag becomes more important as speed increases, and weight becomes more important as gradient increases. On the flat the aero wheel will be faster, but as the gradient increases the lighter wheel will gain until at some point it will have the advantage. What is that point, and what are the advantages on either side of it? On the flat, the Zipp is 2.48 kph faster. At a gradient of 7.5% the two wheels are being driven at the same speed, 12.87 kph. At a gradient of 15% the lighter wheel has a very small advantage of 0.03 kph. This is a dramatic result – I think it means that for any actual road ride containing a mixture of gradients the aero wheel will have a significant advantage. It will only lose out on the very steep bits, and then only by a small amount. The weight of the bike and rider but without the wheels is 88 kgs. About right for me and my bike and some water. I don’t believe the results will be very sensitive to this assumption but I have not checked. The drag of the rear wheel will be 20% of the front. The rationale behind this assumption is that differences in the aero characteristics of the rear wheel will contribute less to differences in the overall than the front because it is shielded by the frame and the rider. I originally assumed 50% but Victor Major of Velocite suggested that the front contributed at least 80% of the total wheelset drag. The drag of everything but the wheels is 200 watts, so it would take (200 + 16.7 x 1.2) = 220.04 watts to drive a Zipp equipped bike at 50 kph on the flat. Drag varies with the square of the speed, so the drag at speed S = drag at 50 kph x S2/502. I am sure this won’t be exact in the case of the wheels because the bottom of the spokes are nearly stationary and the top are moving at nearly S x 2, but I think it will produce an acceptable result for current purposes. The results will vary depending upon the power of the rider: the more watts he can generate the greater the aero advantage, and the greater the ‘break even’ gradient. 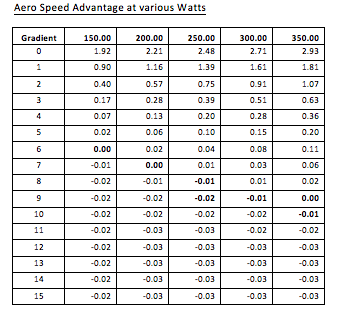 The chart below shows the speed advantage vs gradient for a range of wattages from 150 to 350.
the speed advantage on the flat varies from 1.92 kph at 150 watts to 2.93 at 350 watts. The break even gradient varies from about 6% at 150 watts to 9% at 350 watts. 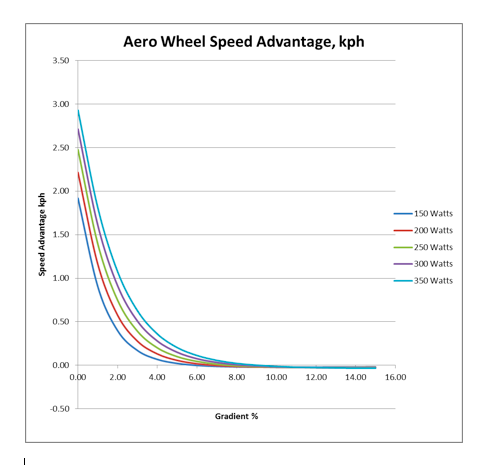 At 15% the speed disadvantage of the aero wheel is never more than 0.03 kph. The table behind this chart is in the Appendix. I have just ordered a set of Velocite RT50’s, a 50mm deep tubeless carbon wheelset.